The new Delivery line accounts for 30% of total VW truck exports so far this year. The new Volkswagen Delivery family launches in Colombia with good reasons to celebrate: with advance sales and firm orders booked even before the official presentation, the Delivery 11.180 leads VW’s truck exports to Colombia, building on the line’s international success. The models are already present in ten countries and account for about 30% of VW’s truck exports so far this year. Porsche Colombia, which represents VW Caminhões e Ônibus in the country, was responsible for the launch in Bogotá. As well as the 11.180, a success even before it arrives in the showrooms, Porsche Colombia also unveiled the Delivery 9.170 to Colombian clients and the local press. “Colombian customers already know that VW products are tough and reliable. And the specifications of the new Delivery models, such as design, internal space, ergonomics, and engines have been very well received and welcomed in that market. With the launch of the 11.180 model, we are entering a sector in which we haven’t participated before, with a vehicle which is designed to meet the operational needs of the market. All of this favored the excellent reception of this new product there, at the joint launch with Porsche Colombia,” says Roberto Cortes, President and CEO of VW Caminhões e Ônibus. The light truck segment is one of the most important in Latin America. And it’s not by chance that the new line of VW Delivery trucks is so successful in Brazil. There will be new product launches over the next 12 months in all of VW Caminhões e Ônibus’ export markets. 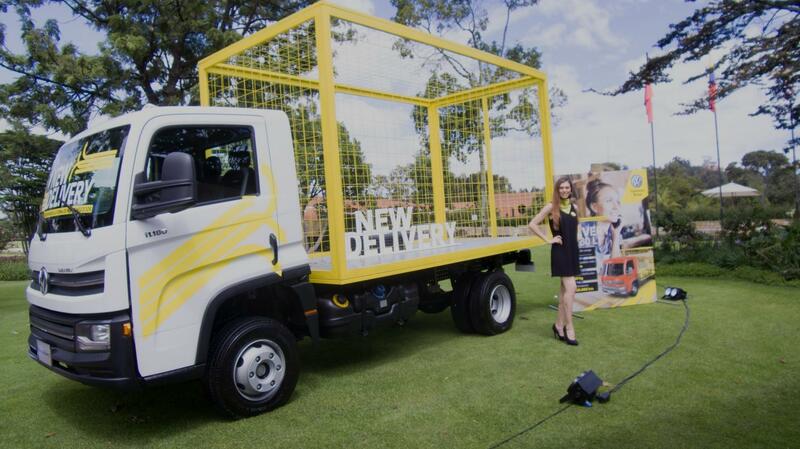 The new Delivery family arrives to revolutionize the light truck urban goods transport segment. Developed and produced in Latin America, the new family of vehicles already meets international standards for the most demanding markets. Born from the successful recipe of the first Delivery line and the experience of the customers for more than 100,000 units produced, the new line includes models ranging from 3.5 to 13 tons and is ready to conquer the world. By listening to its customers, Volkswagen Caminhões e Ônibus has debuted a range of products that are tailored for today’s needs. With the launch, the result of an investment of more than R$ 1 billion, the brand brings a product that combines the attributes of a large truck with those of a small vehicle to the market, such as robustness along with modern design. With the largest interior space in the category, the new Delivery cabin includes the most innovative new concepts in terms of ergonomics, comfort, interior space and robustness. Manufacturer of Volkswagen and MAN commercial vehicles, Volkswagen Caminhões e Ônibus is one of the largest trucks and buses assemblers in Latin America. Since its start-up in 1981, the company’s goals have always been reaching the top of the market, respecting and satisfying the customers’ needs. And that's exactly what clients get: tailored products and excellent after-sales service. The company is also a reference in technological innovations. Volkswagen Caminhões e Ônibus is a pioneer in the use of biofuels, and in the development in Brazil of a diesel-hydraulic hybrid truck. The company always seeks solutions that reduce the environmental impact and help preserve the environment. For more than 35 years, the manufacturer has maintained its commitment to develop vehicles that exceed customer requirements - wherever they go, whether on Brazilian, Latin American or African roads. TRATON AG, formerly Volkswagen Truck & Bus AG, is a wholly owned subsidiary of Volkswagen AG and a leading commercial vehicle manufacturer with its MAN, Scania, Volkswagen Caminhões e Ônibus, and RIO brands. In 2017, TRATON Group brands sold about 205,000 vehicles in total. Its product offer includes light commercial vehicles, trucks and buses, produced at 31 factories in 17 countries. As of December 31, 2017, the company had about 81,000 employees in its commercial vehicle brands. The Group's goal is to transform the transport system through its products, services and partnership with its customers.